Missouri Education Watchdog: Common Core Aligned Math in Your Student's Backpack: Here's Proof it's Really Not About the Wright Answer. Common Core Aligned Math in Your Student's Backpack: Here's Proof it's Really Not About the Wright Answer. Disclaimer: I know the word "wright" in the above title is misspelled and that's the point of talking about the Common Core aligned math homework coming home in your student's backpack. You got the gist of my meaning and that's the most important emphasis of the message, right? I have a fifth grader at Holly Grove Elementary School on track 4. She’s been in fifth grade for all of two weeks. Her first week of math homework was general review: multiplication and division. Then yesterday she brought home Common Core homework. "Explain how one division expression can have many different answers. Use a specific division expression to support your answer." Do you see a serious problem with this type of math homework? I foresee huge problems as kids have to re-learn real math, the kind that has one answer; one right answer, not a bunch of guesses that they have to explain. They don’t have to know the right answer, as long as they can explain how to do it? Please tell me how this will raise the standards of education if even adults don’t understand it. This kind of abstract math foisted on children who barely have a grasp of basic math is going to accomplish a few goals, none of them being ‘raising the standards of education.’ Let me tell you what I’m already observing in my daughter’s classroom: 1) frustration, 2) tears, 3) vacant expressions that clearly indicate ‘I’m lost,’ and as my daughter now puts it: 4) ”I hate math.” This is only the second week of school. NC needs to reject CCSS, and Wake County should lead the way. Even if you are not convinced how this will be detrimental to our children, please consider how much this federally-mandated snuck-in-the-backdoor curriculum is going to cost NC. Taxes will have to be raised to pay for its implementation. The RTTT funds don’t cover the full program, and the only people who stand to profit from this new misery are private corporations like Gates and Pearson. Our children deserve better! My high school teens start school in a few weeks. You can expect to hear from me again when I review their textbooks – my tenth grader’s Civics textbook was a big red flag last year – such a biased presentation of the political process! I am already aware that fewer AP classes are being offered in order to bring the high schools into compliance with CCSS. So, the way I see it, my IEP child will be completely lost and my accelerated learning teens will be bored because I see the real goal of Common Core is to lump kids into one mold and expect them to learn at the same pace, as in “one size fits all.” Those of you who are/were educators must realize that this is a prescription for failure on a national scale. I encourage you to lead the way for NC by rejecting Common Core. Please allow the parents, teachers, and local school administrators to make decisions about school curriculum. Another school board member responded, insisting that it was only a set of 'standards,' not a curriculum. Obviously none of these people even glanced at CCSS before signing off on it. I know I need to take this fight to the state school board. I emailed the governor, but he's still on board with it, even though the lieutenant governor has done research and wants it blocked. Bureaucrats will be the death of us -- literally. My response, written on the worksheet: "This abstract concept is well beyond my child's comprehension. (Actually this Common Core 'many answers' math is probably too confusing for any 5th grader.)" Since I've already written "this is impossible for any 5th grader" on worksheets, the teacher has already requested a conference. My 11th grader couldn't articulate a response to this question, and he's a math genius. Many parents have written these tests make no sense to students, causing frustration and a budding hatred of math. Is that the goal? 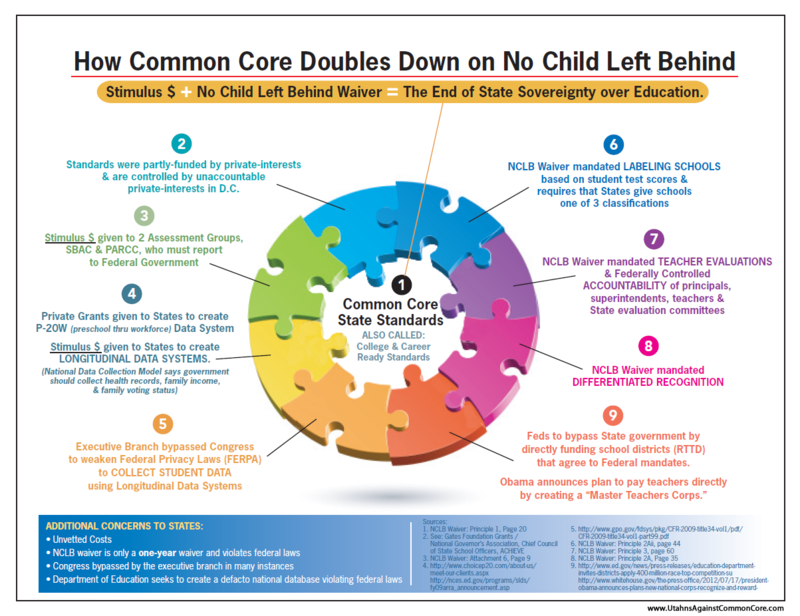 Here's your talking point of the day when CCSS supporters insist CCSS are "only standards". The curriculum has to be CCSS aligned so this video and homework coming home indeed is connected to Common Core standards. Start referring to curriculum as Common Core "aligned" curriculum. This an argument CCSS supporters cannot refute. It's beyond my comprehension and understanding and I'm 60 years old! Why in the hell do they need to know WHY 4 x 3 is 12? And why do they have to write word answers and essays in math class. This is a bunch of bunk that is going to set our schools back 200 years. Common core aside, math isn't just about rote memorization. Those who just memorize without understanding of concept will not do as well later on. We use Math U See in our homeschool, and our children do much better understanding WHY 4x3 is 4 groups of 3. However, this Common Core business is simply nonsense. As long as you know how to get a CORRECT answer, it should not matter that there are 53 and 1/3 ways to do it. Suffice it to say, what works best for one student, will not be the best method for another student. Japan and China and India will just continue to laugh at us while their students get their answers correct. You might want to read Math-U-See's website. They have aligned themselves with CCSS. Their newly updated books contain CCS worksheets at the end of every lesson. I used to love their program but will no longer be buying their product because of a change they really didn't have to make. I'm not second guessing my decision to Home School my 5 yr old son! This stuff has been weighin very hard on me, as an Engineer and a Mother! I'm torn if I'm doing the right thing, but after reading this I know my standards on what he must learn will be far greater (and correct) then our Schools curriculm! When I visited a local private christian school, they bragged that they too were re-aligning with common core just like the Public Schools and my eyes almost popped out when she said that! Private and Catholic schools who jump on the CC bandwagon are foolish. Let the public schools be the beta testers of this questionable untried system for a few years while you continue with your proven superior education. CC is nothing more than a defined set of stds that a private entity decided everyone should learn. They are not the only things students should learn, but those truly participating in them are limited to the CCS with a cap on additional curriculum. In addition, most of the rigor promised is achieved only my moving stuff around in the grades, not adding additional skills or content. The only thing for these schools to smile about in going along with CC is that they won't have to shell out for specialty textbooks that are not aligned with CC. Math is already highly abstract, 'Number' is itself a high level abstraction. Number is a concept that can convey any quantity of anything at all. A number, 3, is a particular quantity, of anything al all. Learned properly, a person is able to easily manage any complex situation, which those without the skill, would be overwhelmed by. The purpose and value of math is not in showing how many cutsie abstractions you can generate from any given equation, but in showing how high level abstractions not only apply to, but actually enhance, your ability to handle reality. And you do that through practicing large numbers of clear, uncomplicated, concise examples, which drill basic rules - the rules and operations of addition, multiplication, division - and results into your mind - times tables - so that you have a solid framework for really using math without having to 'think through' those fundamental steps every time that you are faced with puzzling out the particular set of useful quantities of reality facing you in a given situation. That you can refer to a quantity, any quantity, of absolutely anything at all, with one simple set of rules that apply to anything from rabbitts to quarks, is an astounding tool. That it can help convey the rules and benefits of concepts and of logic as well, is of inestimable value. But it loses its benefit if it isn't presented in such a way as to put the student in greater command of reality, let alone giving them the impression that it is too 'complicated' to be of use to any but the 'most gifted'. This common core method isn't a means of teaching Math, or concerned at all with helping students to become familiar with abstractions, it is instead a means of indoctrinating into young minds that there are many realities, many different truths, and above all else that there is no 'right' and no 'wrong', only different approaches to life. And those who they succeed in muddling their minds so much that they think abstract concepts have no relation to reality and are too hard... will shun them... and those who accept that abstract concepts enable you to escape from reality and make it possible to get away with anything whatsoever... will find a ready place among those who are eager to develop 'standards' which the common core of the people will have no choice but to follow. THAT is the lesson that 'common core' is meant for you to accept. No, This type of abstract thinking, is a great way to introduce critical thinking skills into the children's curriculum. Of course the teachers want the students to get the right answers and of course they want the students to continue to apply the rules of math that they have learned from the previous year, but they also want the students to understand why it is they are getting the answers they want, this is a great tool! Hitting like button on your comment Van. Hitting DOUBLE LIKE on Van's comment! Really it is rather ridiculous. It sounds like an attempt to apply post modern thought to mathematics.